We started back in 1867 to bring the railroad through Denver—an invaluable connection to drive our economic growth. Our focus has always been on making our region a great place to live and do business. We’ve stayed true to that work for 150 years—in some ways that may surprise you—and as we celebrate this milestone, you’ll see we’re more energized than ever. You’re a big reason for our excitement. We hope you’ll stay connected with us throughout the year, on social media and at events, to challenge what you know about your Chamber, celebrate our legacy in the community and continue to make an impact in our region. You can imagine that we’ve worked on a lot of issues—big and small—and with a lot of partners during the last 150 years. Let’s take a walk down memory lane to learn more about our investment in the region and see just how much has changed since we started back in 1867. Crime stopper? The Chamber has offered rewards for tips to help solve crimes. Consider the kidnapping of Benjamin P. Bower: The Chamber offered a $500 reward for information leading to the arrest of the perpetrator back in 1932. On Feb. 28, 1884, the board of trade officially became the Chamber of Commerce. Their mission was to: Promote general prosperity in all the varied interest of Colorado and Denver – not much has changed since 1884. We know that professional sports are an important part of a vibrant region. From Coors Field to Mile High Stadium in 1998, the Chamber has supported the construction of our sports stadiums. In 2009 Kelly Brough, president and CEO of the Chamber, became the first woman in the Chamber’s history to have this title. 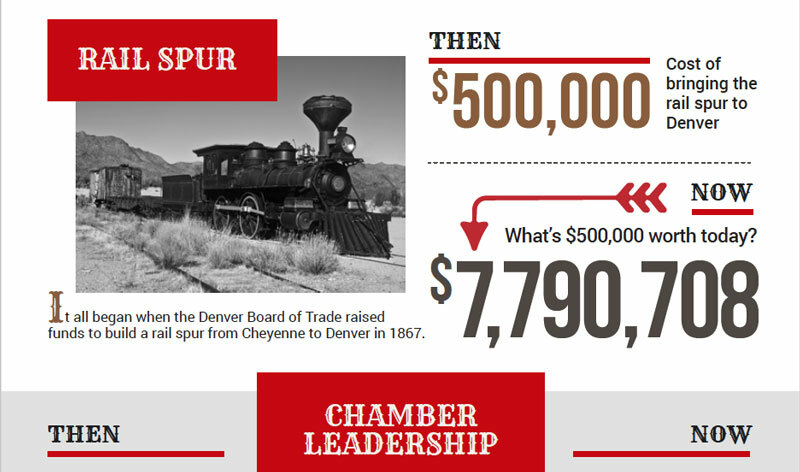 The Chamber was founded before Colorado became a state in 1876. The Chamber hosted President Taft in 1911 to discuss local matters such as maintenance of Fort Logan, the establishment of a mountain national park system and the creation of Estes Park as a national park. A birthday like this was a cause for celebration. See how we celebrated the Chamber’s 150th birthday. Want to be part of putting Coloradans to work? Let us know how we can help you! Join the Chamber today and be part of our next 150 years.